As I was preparing my notes on the civil wars in the late Roman Republic, for which I use the crossing of the Rubicon as a focal point so my students can have an opportunity to look at some primary sources, I was particularly struck by the mention in both Plutarch and Suetonius of Caesar’s attention to gladiators on the day before he crosses the Rubicon, There is no question that this crossing is the symbol of a watershed moment in Roman history, but it is interesting to look at how the moment is developed in ancient sources: Beginning with Caesar himself (presumably writing in 49 BCE as events were unfolding, and perhaps editing after the fact), who fails to even mention the crossing (I personally like how HBO’s Rome depicts this moment and I show the clip in class), to the poet Lucan (mid 1st century CE) who provides our earliest extant source after Caesar, to historical sources like Suetonius (early 2nd century CE) and Appian (mid 2nd century CE) who, influenced by Lucan and his sources, add much deliberating and even supernatural/divine elements, and finally Cassius Dio (early 3rd century CE) who again downplays the crossing. In his Life of Caesar, Plutarch describes Caesar as spending the day at Ravenna watching gladiators practice before sneaking off and crossing the Rubicon under the cover of Darkness. In Suetonius’ version, (Life of Caesar 31.1), Caesar spends the day at public gladiatorial spectacle and reviewing plans for a gladiatorial school he was going to build in Ravenna. Suetonius attributes Caesar’s actions to a conscious plan to avoid suspicion about his plans to enter Italy with his army. In crossing the Rubicon, Caesar is illegally leaving his province and essentially betraying the Roman state. Caesar makes no mention of the time of Day, but Lucan emphasizes the darkness of the night (de Bello Civili 1.187)” obscuram..noctem”) in his account. Caesar’s crossing is made all the more nefarious by doing it in the secrecy of night. Cicero makes it clear that night and conspiracies go hand in hand at the beginning of his first Catilinarian speech when he asks Catiline what he was up to on the preceding nights. Suetonius (Life of Nero 26) tells us that Nero would wander the streets at night in disguise, assaulting people under cover of darkness. I’d apparently never paid much attention to these references to gladiators and Caesar’s activities just before entering Italy. While there is no reason not to believe that this is exactly what Caesar did on that day, it is an interesting and potentially loaded comment in light of its juxtaposition with Caesar’s illegal departure from his province. We know Caesar had an interest in gladiators. As aedile, in 65 BCE, he staged an elaborate set of funeral games for his father, (who had died 20 years earlier) with 320 pairs of gladiators (Plutarch, Life of Caesar 5.5). This number was apparently smaller than Caesar wished to display, because Suetonius (Life of Caesar 10.2) tells us that a decree was issued by Caesar’s opponents limiting the number of gladiators that one could have in Rome. Drawing from my notes on the origins of gladiatorial spectacles in Rome, I’ve recorded a number of the earliest munera. 120 pairs at the funeral of P. Licinius Crassus in 183 BCE, (Livy, ab urbe condita 39.46) is The largest number I have in the period from 264 BCE when the first gladiatorial combats were staged for the funeral of L. Junius Pera to 122 BCE, when G. Gracchus ordered the bleachers in the Forum dismantled to allow free access to the spectacles at some set of funeral games. In addition to his plans to build a gladiatorial school at Ravenna, We also know that Caesar owned a ludus at Capua. Cicero, who with Pompey and the rest of the anti-Caesar faction left Rome once Caesar had crossed into Italy in 49 BCE, provides us with the information, in a letter to his friend Atticus (epistulae ad Atticum 7.14), that Caesar’s gladiators had been planning their escape and that there were 5000 shields in the ludus. Presumably, Cicero includes this number of shields to highlight the large number of gladiators owned by Caesar, although it seems highly unlikely that we should read this as a 1:1 ratio of shield:gladiator. Cicero also includes the information that Pompey has taken care of the potential threat of Caesar’s gladiators by distributing them in pairs to citizens, preventing them from conspiring in large numbers. It is important to bring one more thread into this to explain my thoughts on what Plutarch and Suetonius might have been doing when they chose to include the detail about Caesar spending the day watching gladiators fight before crossing the Rubicon. For ca. three years (73-71 BCE) the Romans in Italy were terrorized by the rebellion of the gladiator Spartacus, which started in Capua and grew in size as the army of gladiators, other slaves, and perhaps impoverished citizens, moved up and down the Italian peninsula. Surely, Caesar’s plans for staging a large number of gladiators (beyond the 640 he did use) in 65 BCE must have stirred the fears of the Romans, who had just a few years before feared an attack on Rome itself by Spartacus. It is also worth noting that Pompey, Caesar’s opponent in the Civil War, helped wrap up the Spartacus rebellion, although it was M. Licinius Crassus who did the bulk of the work and received official credit. 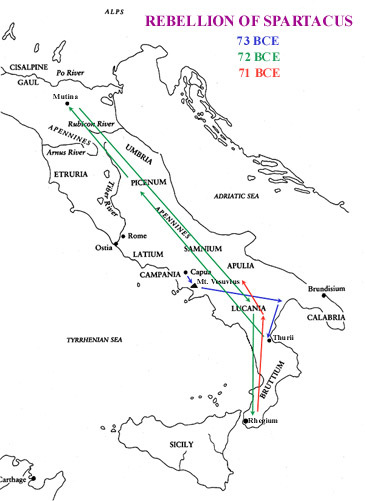 [I like this map as it shows Spartacus’general path, the Rubicon River, & Capua. Lucan has Pompey deliver a speech to his men in which he compares Caesar first to Catiline (2.541). Catiline previously had been called a gladiator by Cicero (In Catilinam 1.12) and identified as an associate as gladiators (In Catilinam 2.4-5 and 11-12). In addition, Sallust (ca. Late 40’s BCE; Bellum Catilinae 30) tells us that Catiline was planning to recruit slaves from Capua, but that the Roman senate dispatched men to make sure the gladiators were kept in lock down. Lucan’s Pompey then specifically compares Caesar to Spartacus (2.554), (and in a twist that matters a lot in thinking about Lucan), and has Pompey wishing that Crassus was still alive to deal with Caesar as he did Spartacus. To wrap my thoughts up, I haven’t even begun to think about how Plutarch and Suetonius present Caesar in their biographies as a whole. My general recollection is that they are not particularly negative, and so that may leave all of my potential nefarious connections to Caesar and gladiators without much foundation for subversive readings of these authors’ inclusion of these details just before they describe Caesar crossing the Rubicon. Maybe some Caesar scholars have further thoughts to share.